On-song Saints find themselves in seventh heaven as their bid for Grand Final glory gathers momentum. Seven wins on the trot - the last two in the Super 8s - sends a chilling message to their rivals that the 2014 champions have hit their straps at the right time and on course for at least a place in the semi-final of the competition. Realistically, the chance of Keiron Cunningham’s outfit improving on their current fourth-in-the-table spot still remains in the lap of the Gods but all the players can do is treat each game as a cup final and they will have no difficulty in raising their game for the next hurdle - a high-profile derby showdown against Wigan Warriors at the DW Stadium on Friday. They won 23-4 in the final game of the regular season at the same venue a few weeks ago but that will count for nothing against a Wigan side who will be hell-bent on turning the tables on what will be another emotional and tension-charged occasion. 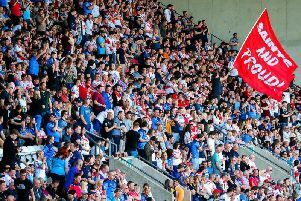 Saints will, however, need to adopt the same mindset as they showed in toppling fifth-placed Catalans Dragons 39-16 at Langtree Park last Friday night if they are to lower the Cherry and White colours. It was an 80 minute display full of character, resilience and true grit as they overcame an early 6-0 deficit and the late first-half sin-binning of a scrum half Luke Walsh for what referee James Child perceived as a dangerous tackle on Lucas Albert to secure a crucial victory and leave the French trailing four points in their wake. It was also a night to remember for jet-heeled winger Adam Swift who scored four tries on home soil for the second time this season and although all were of a spectacular nature, he would be first to acknowledge the contribution of his team-mates in what, in essence, was a ruthlessly efficient, never-say-die 17-man performance against tough-as-teak opponents who took no prisoners. Cunningham, who admitted Saints were riding on the crest of a wave at the moment, observed: “I was expecting some kind of lull after tough away wins at Wigan and Warrington and we tried to overplay a bit in the first half. “But we put them to the sword in the second half and now the boys are hungry to go again with a derby at Wigan. The only blight on the night for Saints was a leg injury to centre Mark Percival which is likely to keep him out of action for several weeks and the fact that both Walsh and Luke Thompson will face the RL Disciplinary Committee on Tuesday night.